Cut the lamb ribs apart and put them in a stewpot. Add the salt, black pepper, red pepper flakes and water. Bring to a boil over high heat and skim off the foam as it forms. After 10 minutes of boiling, add the whole tomatoes and onions. Cover the pot, reduce the heat to low, and cook until the meat is tender. Serve right away. 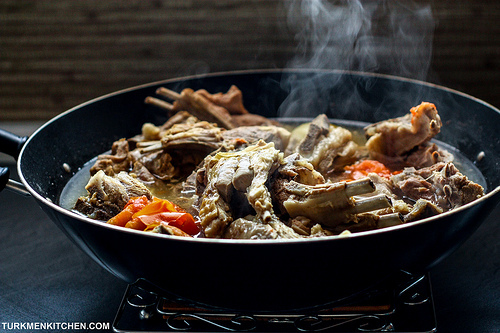 what is the definition of LAMB RIB STEW. Like where it originated or how Turkish people eat it. Share please a little description about the food. Thank you. I always thought Chekdirme (and Suzme) is cooked with rice!!! If its not then what it is that is cooken with rice,onion,meat and sauce?! Do you mean Palaw or Şüle? Süzme is strained yogurt. How long are you supposed to cook until meat is tender? Is there a time approximation?